Meat is not only a nutritious, but also a useful product. To the use of meat, people came thousands of years ago. There is a theory according to which the use of meat has given a new impetus to the development of mankind. And recently vegetarianism has become a fashion, many people still remain convinced meat eaters. Man is a carnivorous creature, although he eats mixed food. The protein we get from meat goes to building muscles, provides energy and vitality, that’s why you need to eat meat. Most of the meat is water. And only 20% are proteins. In addition, the meat contains mineral substances and fats. More fatty meat contains less protein. Amino acids contained in meat proteins are represented in meat in the ratios most suitable for humans. The organism is better absorbed by proteins of animal origin. They are faster and more fully digested. 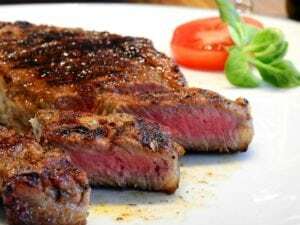 This article describes how to prepare a steak at home in a frying pan. You also learn what steak is, popular steaks and what meat is used to make it. 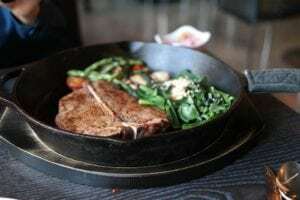 Of course a steak cooked in a frying pan will not be as close to an ideal as the professionals on special kitchen utensils and grill. But in the art of cooking steaks with something and yes you need to start. Steak is a quality cooked thick piece of meat cut from the carcass of an animal. Thickly sliced ​​steak creates an excellent crispy crust, while the meat is not over dried inside. With thin chunks, the steak is overcooked from the inside, when the crust just starts to brown. If you prefer a ruddy outside of a steak with a juicy, pink center, choose thick pieces of meat. It is best to defrost the meat in the main compartment of the refrigerator – the steak will be thawed about a day. If you need to defrost faster, you can put it in a vacuum package in cold water. Then in an hour the steak will be ready for cooking. 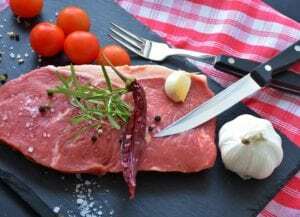 Defrosting the steak in the microwave is not recommended – even in the defrosting mode, the upper layers of meat begin to be prepared, while the middle is still cold. Then it will be difficult to achieve a uniform roast. Under no circumstances should meat be thawed in warm water or at room temperature. Salt the steaks in advance and allow them to reach room temperature before frying. Salt at least 40 minutes before frying. If you salt the meat before cooking, this will give the opposite result: the moisture will come to the surface. If you solite in advance, the process will go differently: salt draws moisture to the surface, where it settles in small puddles. Meanwhile, the salt softens the meat and breaks the protein. After a quick softening, the moisture, elongated with salt, begins to be absorbed back into the steak. So your steak turns out to be more tender and juicy. If there is no such pepper, then it is possible to pepper the meat from both sides (and not along the perimeter of the edge) with pepper from the mill. It is worth considering that usually, when cooking a steak on the grill, do not recommend pepper meat before frying. Pepper can burn during frying and give a pungent taste. When the steak is cooked in a frying pan, the pepper does not have time to burn. Some say that steak will not spoil the steak, others – “a good steak does not need it”. Then again, do some experimentation and see how much you like. Spices can be added before frying or during: 2 minutes before the end of frying. If we add before frying, then salt and spices can be rubbed into the meat lightly patting and stroking your hand. Do this with both surfaces of meat. If you add during the frying, then about 2 minutes before the end of cooking, add 2 tablespoons of butter to the pan, as well as your favorite herbs and flavors. Butter will fill the steak with a rich smell. Slightly tilt the frying pan and spoon evenly distribute the oil over the surface of the meat. Vegetable oil increases the thermal conductivity of the steak and allows for more even distribution of heat. In addition, when frying on an iron or cast iron frying pan, it does not allow the steak to burn. Lubricate the steak with a brush or whatever, and do not pour oil on the pan. Pour on a well-heated frying pan 1-2 teaspoons of oil and when it starts to smoke put a piece of steak. Use a multi-layer frying pan with ribs and non-stick coating and do not use oil – is considered the most desirable option at home. Do NOT put the steak on a cold frying pan. The frying pan must be well heated. Put a piece of steak in a frying pan and start frying without losing power. The duration of steak roasting is 3-6 minutes on each side, depending on the thickness and the desired readiness. Food, which is often turned over, is cooked faster and more evenly. On the other hand, meat does not have enough time to fry nicely, although it still emits enough flavors. Try it yourself and see how your steaks work better. The cooking should satisfy your own preferences. The total cooking time depends on the thickness of the piece of meat and the desired availability. To accurately determine the timing of the steak, you can use a culinary thermometer. But if it is not there – it does not matter! A thermometer is the best choice if you are experimenting and want to achieve a steak with an ideal taste and consistency. An electronic thermometer should only pierce the surface a little and show the temperature. After the meat is removed from the fire, you need to let it lie for 2-5 minutes (you can cover it with foil). During this time, all the juices will be evenly distributed throughout the piece.